Just when I thought there would be nothing more for me to blog, it never fails that some anti-GMO post comes up that just infuriates me. Who is the latest awardee of the anti-education/ anti-farmer movement? It’s none other than the Food Babe. The Food Babe has decided to attack the small farmers of Hawaii that includes my dad, brother, and their farm manager, Neil, as well as the hundreds of others including the organic farmers. She posted an article telling her dimwitted, gullible followers to avoid Hawaiian papayas because they are GMO. She spells out the types that are GMO and the ones that allegedly aren’t. She even tells people to buy papayas from other countries and claims that even organic ones are contaminated. She never discloses any real facts about the Hawaii Papaya Industry Association either. She only perpetuates the repeated, factless myths about biotech and tries to make a connection about pesticides to papayas. I laugh because the Environmental Working Group found that papayas have some of the lowest residues of pesticides yet they quickly tell consumers to buy organic variety without any explanation! Nor does Vani mention that the people who grow papayas here are all small family farms! 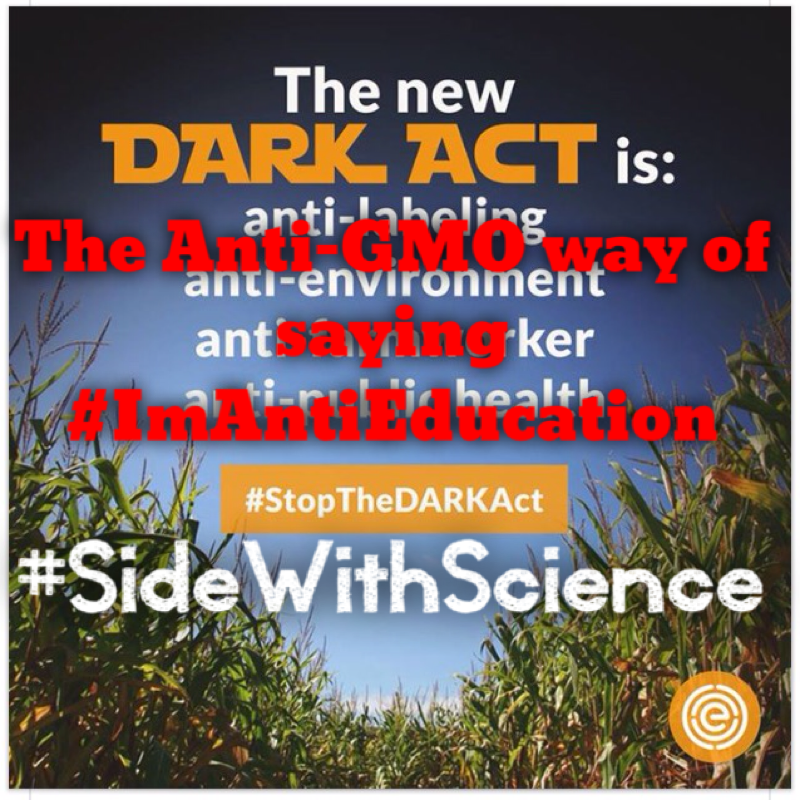 Why I say the anti-GMO folks are anti-education is because she has no mention about the nature of the modification or how this technology saved the industry here. These activists talk about people being in the dark about GMOs but they obscure any facts from their followers. Facts make people think and thinking is dangerous to this house of cards. She will never post real science or anything that actually educates people like this. I’m starting to think that this anti movement is really anti-American at heart. They attack an innovation that has saved the smallest of farmers that have no ties to big ag. They attack the legacies of long time, multi-generational farms here in Hawaii. Majority of the papaya farmers here came to the U.S. with nothing and built themselves up through hard, honest work and dedication. Their families learned the same lessons and carried on those same dreams. The Hawaii farmers are becoming fewer as many are retiring and the next generation does not continue those farms. Vani and her ilk must want people to quit farming altogether with the way she blatantly spreads misinformation. It’s really disgusting how people like the Food Babe and others like Nomi Carmona of our Hawaii Babes Against Biotech can bring nothing but factless campaigns to our state and feel good about their actions. They perpetuate attacks against the hardest working people I know. They can sit pretty and go on TV or spout their BS about their “expertise” against farmers. How can anyone with a conscious ever do such a thing? Apparently it’s easier to make money lying than it is to farm. These women know nothing about earning an honest living through actual hard work. A broken finger nail is likely devastation to their careers. I applaud the generations of papaya farmers that toil on their farms everyday to grow these miracle fruits that Vani Hari calls them. Yes, it’s a really good product that millions have enjoyed for nearly 20 years thanks to biotechnology. Our customers who buy our papayas for decades know how healthy these biotech miracles really are. Vani probably doesn’t even know that papayas are staples here and might contribute to why Hawaii has the highest elderly population in the US. So Vani Hari and the other anti-education activists out there need to get a clue and either work on a farm and grow a comparable crop. They need a lesson in honesty and some work ethics before them come criticizing my fellow farming friends. When the Food Babe can grow a sweet papaya like our Hawaii farmers and talk real science, I might stop criticizing these charlatans of Google. P.S. 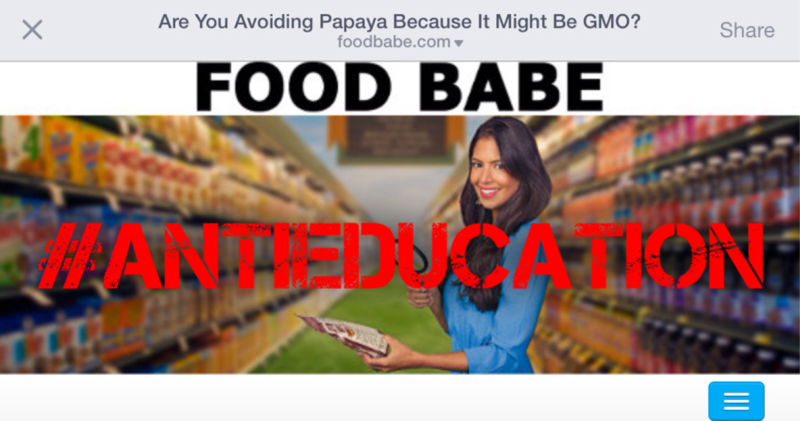 Food Babe better adopt her precautionary principle with the imported papayas. Many countries have their own strain of PRSV infecting the papayas making it a natural GMO. Guess she’s better not eat these fruits at all! This entry was posted in The Farmer's Perspective and tagged Food Babe, Nomi Carmona. Bookmark the permalink. What about people who corn.anti GMO corn is GMO to the max. Hi Joni, it would be hilarious if it wasn’t so sad about the level of knowledge that some folks have regarding produce grown in other countries! To recommend that people buy papayas that are grown in Asia, Brazil, Belize, and Mexico is ludicrous. I did a consult job for a group of farmers growing papaya in the south of China (Hainan Island – known as the “Hawaii of Asia”) 9 years ago. When I asked to see their pesticide shed I was at first amazed and then aghast when I realized that all of the products I saw were used to grow their papayas. They had products that were banned in the U.S. for use on papaya, like Thiodan (endosulfan as the active ingredient, a known endorine disrupter), and then I realized that there was no regulatory oversight in those countries that was anywhere near what our own Environmental Protection Agency (EPA) was like. As far as they were concerned any pesticide that was manufactured was fair game to spray on their crop. So, when buying papayas, or anything else originating outside of the U.S. let the buyer beware. That’s what is so sad about this state of finger pointing that we now find ourselves in. So let me say this firmly, and with conviction, farmers in the U.S. are heavily regulated on what they can put on or into their crops! This regulatory environment has led to the movement of production of many of our most common produce items, such as tomatoes, south of the border, where the laws are so much less severe. So what happens when those products are shipped into the U.S. for sale? Are the illegal residues simply ignored? No, there is such a thing as an import tolerance. If a pesticide residue is found on an imported fruit or vegetable that is not allowed for use on American farms then an import tolerance is created which allows for the legal importation of that product. The tolerance is simply the amount of pesticide residue that is allowed on the crop at the time of harvest. This is what our farmers in Hawaii and the rest of the U.S. have to deal with. A double standard exists in the regulation of pesticide residues found on crops grown elsewhere and in addition to that double standard our farmers have to deal with those in our own communities that deride and persecute them. This makes me very sad. It is no wonder that the next generation does not want to farm. John, better keep that from the Food Babe! She might have an organic panic attack. Great post! 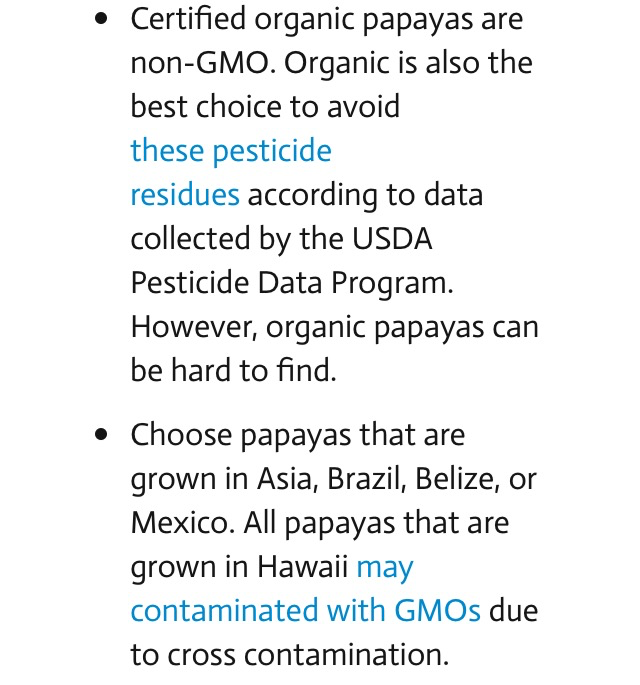 What irks me is that the pesticide residue issue has nothing to do with why papayas are GM. Ugh. It is infuriating how people hype up this nonsense and it spreads like wildfire. It’s time to spread facts to cut down this harmful misinformation campaigns. Recommending that people buy papayas from Mexico when they have been tainted with salmonella in the past is seriously contradicting all the other BS she spews. I for one, only buy Hawaiian papaya. keep up the good work, some of us DO appreciate all that you do. Thank you Karen for supporting the Hawaii farmers! In this day and age, people are so farm removed from how they grow food that it’s easy to be caught in the misinformation campaigns. It’s so sad! Great blog. FYI: In case you didn’t know, your recent post just got linked to on the “Banned by Food Babe” group on Facebook (by Karen M. above)… which is fairly extensive, if you’ve never seen it. Everyone there’s been banned from the Food Babe’s FB group for correcting/contradicting a factually incorrect statement of hers or even just disagreeing with her. Ha! Thanks for letting me know!!! You hit the nail on the head, it’s not about fact it’s about their profit bottom line. It is anti-science at heart. That’s why many of the same players are also anti-vaccine,chemtrailers and,even, creationists.